EZCast for Android reaches 1.9.725 version. See what's new and download it from here! EZCast for Android reaches 1.9.725 version. You can download it from here, here or here (30 MB). See details about previous version 1.9.724 from here. 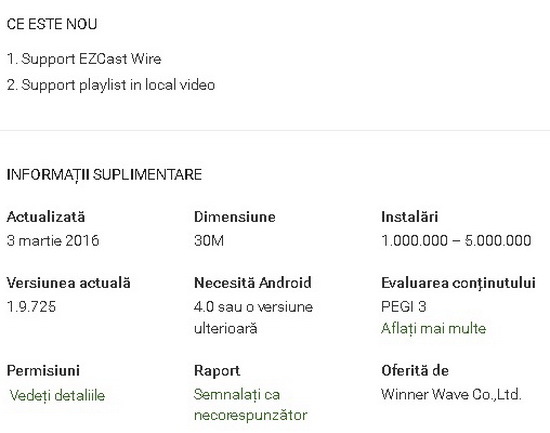 EZCast APP for Android version, developed by WinnerWave, displays and exchange your multimedia from your Android embedded smartphone and pad wirelessly via EZCast devices or platforms. Supports photo display, document presentation, web browsing, camera mirroring, music and video streaming. Everything you want to know about EZCast previous versions you’ll find here.